Do you ever have those moments short or long when you feel good because everything comes together and is moving along in perfect sync? It's a lot, but everything is running smoothly? And, you're actually making forward progress? It's a great feeling. You are getting things done, able to spend some time relaxing or engaged in a fun hobby or activity. But...in the back of your mind, you know that, if one thing goes wrong, everything else will crumble. This is how I feel when fall arrives. School starts and so do extracurricular activities. At this point, the only time we don't have something going on is Friday evening. Don't get me wrong. I don't mind it. In fact, I enjoy it. It's a great piece of being a parent, taking your kids to participate in activities that they truly love doing. But...if one thing disrupts the well-oiled machine you've got going, keeping everything else moving forward creates a major challenge. I asked the Runes, "Once things come together, what can we do to keep them together?" 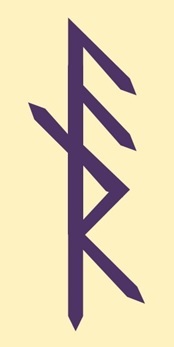 By looking at the Bind Rune at the top of this post, I think you can tell that the three Runes I drew to answer this question - Ansuz, Raido, and Nauthiz. Then, I had to determine how to bind them. Why bind them? It's simply the idea of some reinforcement of the idea of holding things together. It took a few tries to get the one that felt right. Maybe I should have gone with one of the others (above in shades of green), but the one on the left felt too tight for me, and too heavy. The one on the right looks like it is stretching apart already. That just increased my concern about my "coming together" coming apart too. That is why the one at the top works for me. It felt like the right representation for this - a line down the middle to hold everything together, with movement on each side at certain times. 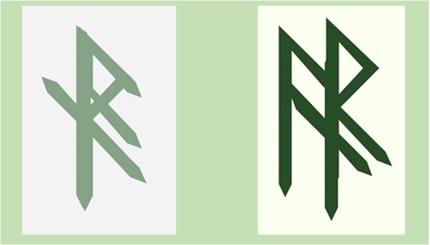 These Runes also tell a "coming together" story. Simply put, if you want to keep everything together, there are three vital pieces. "You must communicate with everyone involved," says Ansuz. But, like the mouth of the river (think river delta), communication is a complicated network. There are people directly involved on a regular basis, some who participate occasionally, and those who are on-call in case of an emergency. Why is this important? Because, Raido indicates a journey, movement; even though everything is coming together, it is also fluid. That is to say there are a lot of moving parts, which sets the stage for one of those parts to to go off in its own direction. A child gets sick; an appointment gets missed; something gets double-booked. Essentially, this "coming together" of activities is a series of interdependent journeys within a single system. Nauthiz looks at needs and necessity within the "coming together". It gives us pause to question what we're doing not in the sense that it is wrong, rather in the sense of, "Is what we're doing in our 'coming together' what we need to be doing? Is it all necessary?" The answer can be yes; but checking in on this is important. If everything that we're doing in our "coming together" is necessary, then we must also recognize the other two pieces the fluidity of it and the need to communicate to ensure its success. If it's not necessary, we have the opportunity to recognize and correct it.